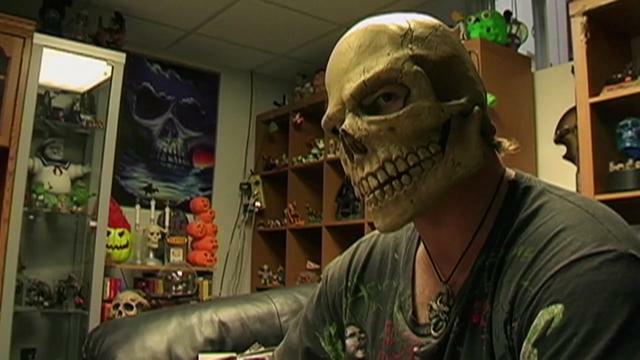 Greg Sommer (Skull Man) is a unique and eccentric individual. And in this fun little film, we get a look inside his life, and where he finds joy. For him, it’s his alter ego, and a fun little sport he discovers. And yes, I am calling it a sport. Growing up in Toronto, Greg created an alter ego for himself during high school, by donning a skull mask, and with that added degree of anonymity, he found himself. Skull Man is a joyous, loud and rockin’ dude who loves fun, and has a heart of gold. With the help of some loyal friends, he embraces a fun little creation by some Australians, known as Box Wars. People build intricate costumes and weapons out of cardboard, and in truly epic style, they battle with one another until only one is left standing. Greg is an open guy, he’s a little odd, wearing his heart on his sleeve and embracing his sense of self and his sense of humor. The film is delightfully amateur in the way it was shot, and that is not meant as an insult, it’s the new breed of filmmakers shooting on increasingly affordable technology, creating films they way they want. Greg makes for an interesting subject, and the film is entertaining, even when some of the subject matter could be seen as a little out there for the common viewer. This is a film about a man who knows who he is, and embraces it, never worried about what anyone else thinks of him, just happy to be doing what he’s doing. Skull World screens tonight as part of the Canadian Film Fest. It’s showing at 9:15 at The Royal Theatre, have a look at a side of Toronto, and sports you may not have seen before.